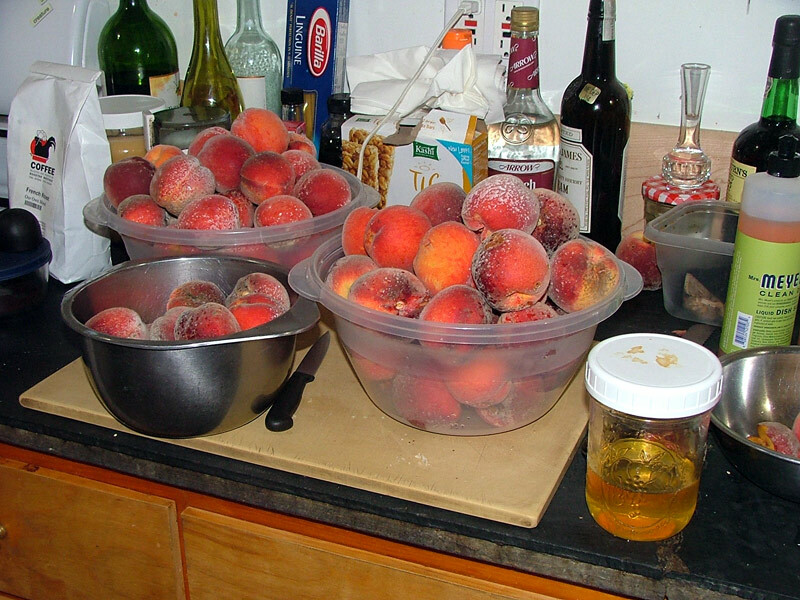 While we were away for a week in Canada, our peach trees were busy ripening their fruit. The weather has been hot and dry, so I lost about 1/2 a bushel to the ground and the red squirrels. That leaves about 2 bushels for canned pie filling, Peach Brown Veronica, peach puree (canned for Daiquiris and ice cream this winter), frozen peach slices and mmmmmmmm, oven jam. Wash and then dunk the peaches, 5 or 6 at a time, in a large pot of boiling water for about 45 seconds. 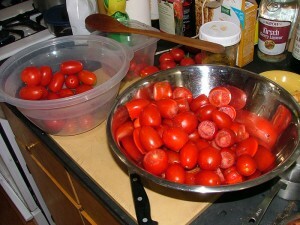 Scoop them out with a slotted spoon and let them sit in a bowl of cold water until cool enough to handle. The skins should slip off easily. Slice the peeled peaches into a bowl and add 1 tsp of lemon juice and 1 Tbsp of sugar for each batch of 5, and stir.I sliced up almost a bushel of peaches for this batch, but any amount is fine. If you like, save the pits. They haven’t been processed and should sprout. I’m planning to plant a row in a distant part of the garden to see what comes up. Next break the fruit into a uniform consistency in the wide setting of a food mill or a food processor. It shouldn’t be mushy. Add one C white sugar and 1 Tbs of lemon juice for every four cups of peaches (this is easy to do in the bowl of a food processor). Pour the mixture into a buttered large, heavy oven proof pan or several (I use two Crueset casseroles) and bake in a 300 degree oven for 1 1/2 – 3 hours, depending on the depth of the pan and water content of the peaches. Stir every half hour or so, more toward the end of the cooking time. The jam should darken in color and become almost translucent at the edges – like pie filling. My Blue Book says the mixture should “round on a spoon”. Fill sterilized jars with the hot mixture and process 10 minutes in a steam canner. You could reference the Blue Book for regular kettle processing time. This recipe makes a wonderful, full bodied jam for toast or biscuits, but it’s also great on ice cream, as a cake or pie filling or drink mix. And a full stock kettle of peach pieces will net about 5 pints of jam – a fairly efficient way to store a lot of peaches. Next, we’ll have to do something about the tomato situation. This entry was posted in condiment, gardening, horticulture, recipe, vegetable garden and tagged garden, harvest, kitchen, orchard fruit, recipe, summer on August 23, 2010 by APo.